Local businesses shape the character of our community and rely on local custom to thrive. Brighton & Hove is a Fairtrade City. This means that the Fairtrade Foundation considers that the people of the city are helping farmers in the third world to be paid a decent wage and provide opportunities for their local communities to be sustainable. 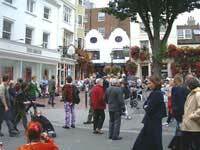 For information where to buy Fair Trade goods in Brighton & Hove visit the Brighton and Hove Fair Trade City website. The Green Growth Platform is a green business network offering members business support, events, innovation and training. The Sustainable Business Partnership runs sustainability focused training and networking events for businesses. They help local businesses save money through energy, waste and water efficiency. Membership is free. Learn how to save money on your utility bills at UTILISE, a free workshop for businesses.